4 in 1 Function:Detachable fork, spoon, knife and can/bottle opener.Item come with the whole part, not separately, please do not worry.The item can be detachable. Made of stainless steel material,rust proof, stain proof and non-stick. Human engineering mechanics handle design, durable, rust free,comfortable, lightweight, very easy to carry. 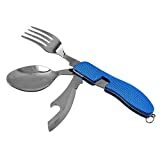 Separates for use of the knife and fork at the same time,perfect solution for students, scouts or travelers eating with flimsy plastic cutlery. Great for camping, BBQ, hiking, fishing, picnic, trip, etc. Use as a spoon, knife, fork, and bottle opener. Meet your different standard. Can be divided into 2 parts. Spoon and knife can be used separately. Portable,small and lightweight, easy to carry. Foldable and detachable design, easy to carry and clean. Great for camping, hiking, BBQ, picnic, trip, etc. Note: there may have slight color difference due to monitoring and light effect. 1-2mm error is acceptable because of manual measurement.